When it comes to green technologies, people are usually first appalled at the initial cost of a project. Many see the large numbers and high projections of time investment before they can even think about how much money could be saved in the long run. Even though there has been push-back from the government, city officials and citizens claiming that tech such as solar panels or wind turbines are both very expensive and not aesthetically pleasing have been steadily pushed aside in favor of renewable energy sources. While these projects are expensive, however, they are also great for the economy - with more jobs and people putting their money back into the community - and the supply chain industry.Renewable wind energy has recently been making headlines for its myriad benefits to the supply chain and communities at large. 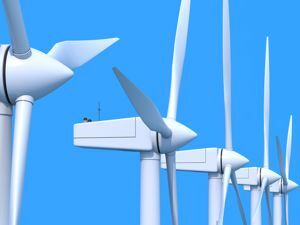 The winds of change are certainly blowing on a global scale in terms of turbine technology acceptance. Projects in Great Britain are wrapping up just as the people of Chicago are looking to propose their own. In Great Britain, the new wind farm is small, but certainly made a big impact in the local supply chain. According to reNEWS, Banks Renewables awarded contracts to local suppliers whenever possible. Much of the £11.7 million budget went back into the community of North Lancashire and the surrounding areas. Over in Chicago, many companies are looking to establish turbine farms and take advantage of the wind that the city is so known for. In a large manufacturing city like Chicago and the surrounding region that also sustains itself via production, re-outfitting factories with energy from wind turbines will help cut down on emissions. Crain's Chicago Business asserted that new Illinois plants could be powered by nature, without using precious water from the Great Lakes and without making any landfills. Building these new projects will put people to work with money in their pockets, and help to make Chicago the greenest city in the world. When it comes to reinventing the way materials can be produced, people have been turning to green energy as a sustainable and renewable resource. In places where wind is not only constant, but has the means to be harnessed, we should be taking advantage of our local suppliers. The whole supply chain can find new life with green solutions, from building the technology in the first place to lowering costs of production to keep money in local communities.